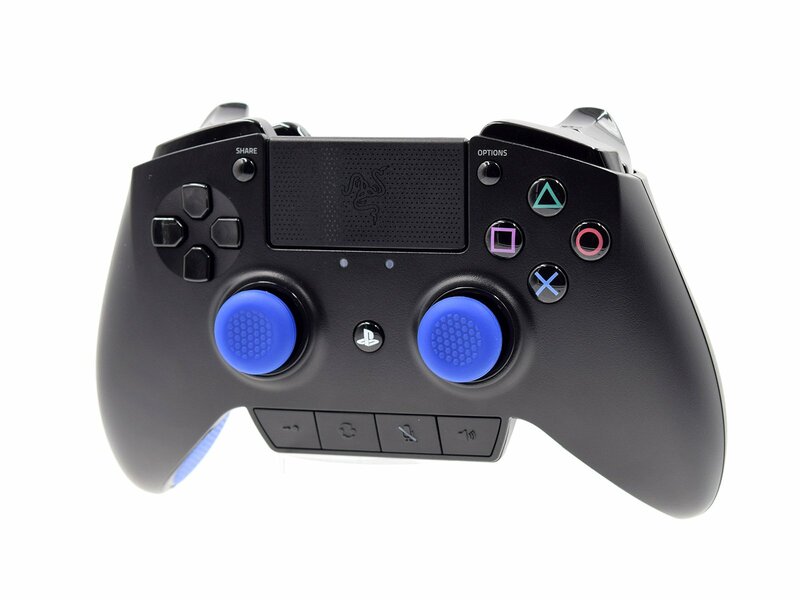 Here is a summary of a Razer Raiju controller for PlayStation 4 released in 2017 by the company named Razer that is known to produce cool gaming accessories. Although not manufactured by Sony, it has officially been licensed by the corporation which undoubtedly raised buyers’ expectations on the product performance. 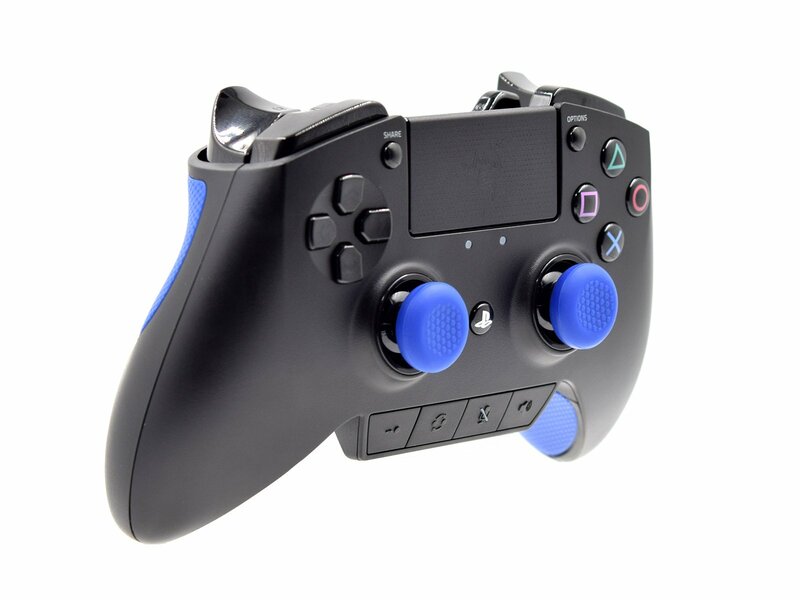 The controller delivers a great design resembling the shape of Xbox 1 remotes, responsive face buttons, two pro buttons on the top along with grips for an extra handle, adjustable triggers and another two extra functional buttons on the bottom. Unfortunately, the gadget has to be wired directly to the console and has no possibility to be run wirelessly. Priced at around $150, it does come with a decent build quality and has an edge to it truly can satisfy the expectations of the most demanding gamers like myself. The product packaging deserves special attention. Razer invests a lot into marketing and advertising and it got this part just right again. The controller comes in a big box which immediately creates a positive first impression. Once opened, there is a welcoming letter inside with a message from the Razer team that makes you feel truly special. Once you reach a hard shell carrying case featuring a Razor logo at the front, you get to unzip that nice looking folder. There comes the most exciting moment - holding a Razer gaming pro controller for PS4! Continuing to examine the contents of the box, on the bottom we find a guide with information written in multiple languages that explains how to operate the functions of the product such as Multi-Function Bumpers, Triggers set up and more. You will also find two Razor stickers in the manual as a bonus. 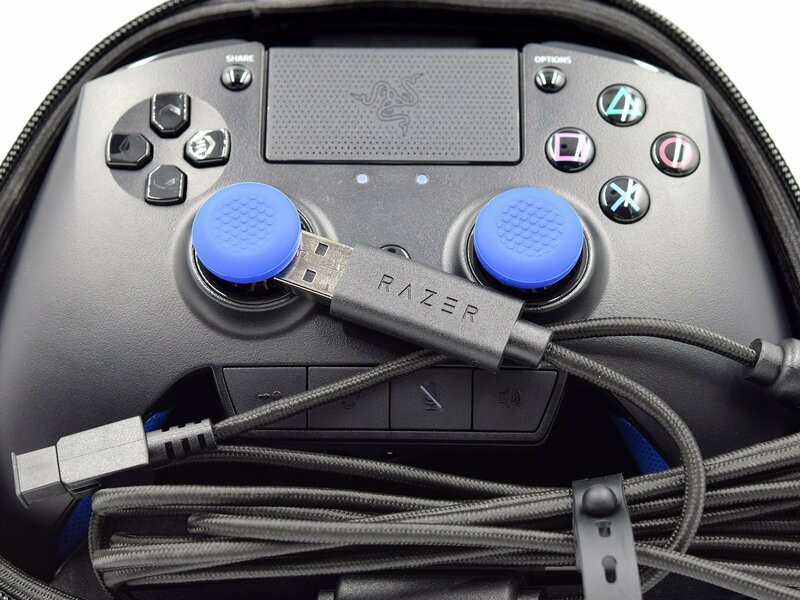 There is also a high-quality USB cable, featuring a strong, braided wire that's far lengthier than a standard DualShock 4 cable so wired connectivity won’t seem to be an issue. A handy screwdriver comes inside the carrying case and it can be used to remove extra triggers on the back. Yes, you can actually remove them if don’t intend to use those triggers in your gameplay. 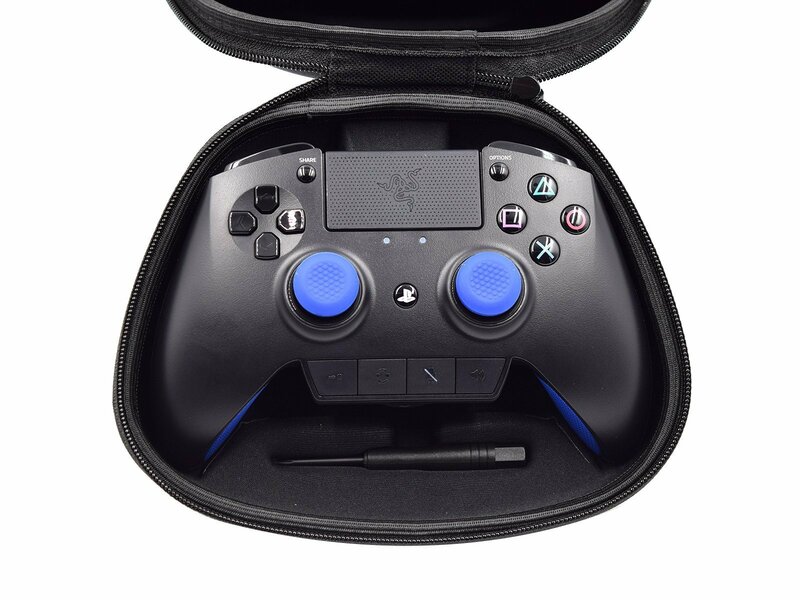 From the first look at the product, you can tell that Razer professional team has put a lot of thought and effort into the design to make sure the controller will stand out. The device is bigger and heavier than a standard PS4 Dualshock and, like mentioned above, is shaped very much as Xbox One remote. This shape solution gives a massive look and expensive feel to the unit. Now let’s dig more into the cons and pros of the controller. 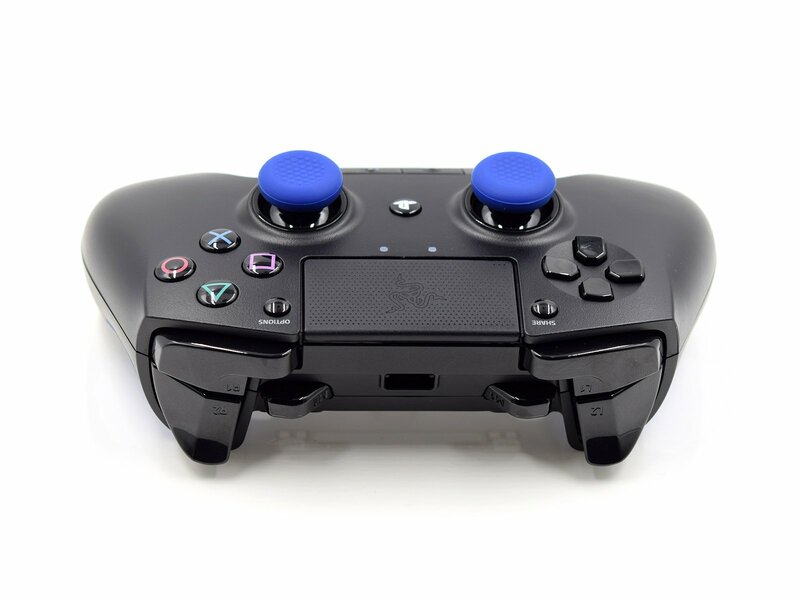 The biggest drawback of Razer Raiju, in my opinion, is the thumb sticks. They could have been a little longer and offer a smaller surface area similarly to Xbox One sticks. Raiju ones feel too massive and slippery that affects an ability to control movements accuracy. 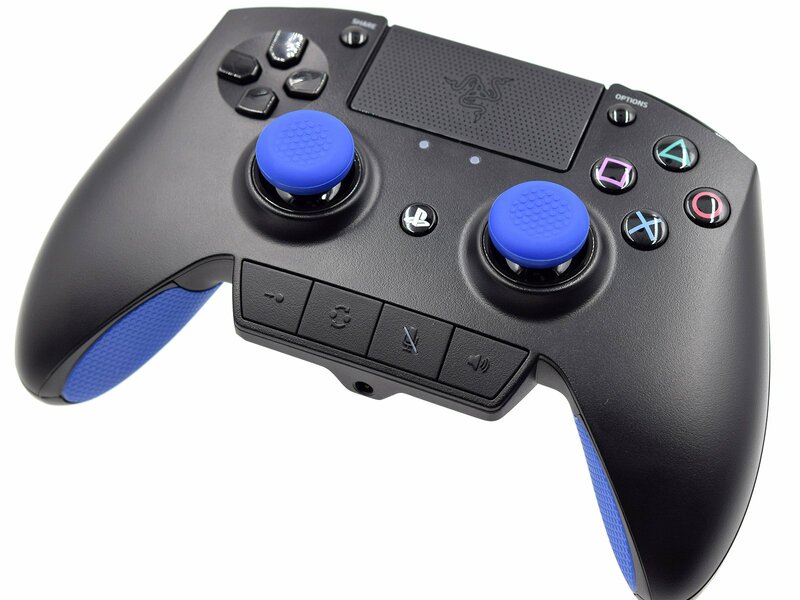 A great advantage of the controller thumbsticks, however, is that Razer has stayed loyal to Sony standard sticks layout and provided a traditional horizontal solution which is appealing to most gamers. 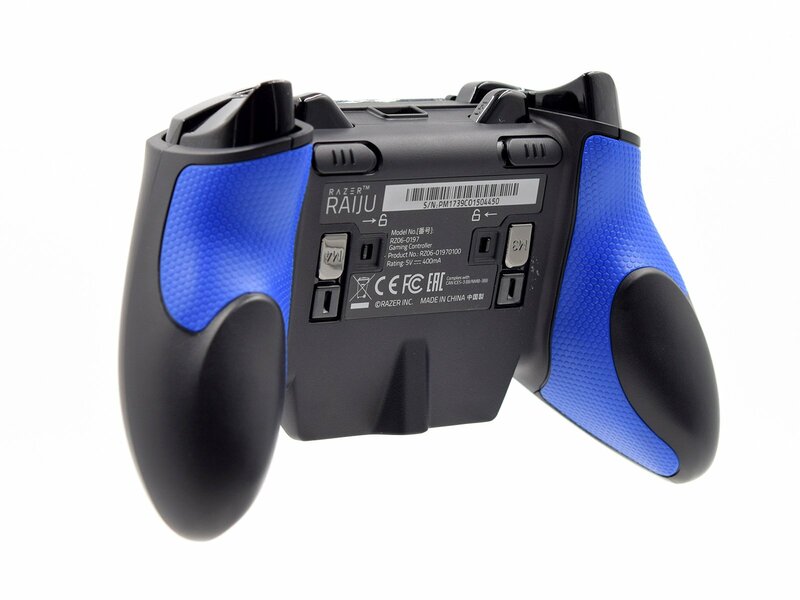 Thumbs up for Raiju trigger locks - they allow you to adjust how far you can press them via a back toggle switch. With the locks engaged, the triggers lose the majority of their depth, meaning that you can tap them half way rather than push them all the way in. This feature is especially useful when it comes to First Person Shooter games as it will definitely give you an advantage in response time. The controller features same face X, Square, Triangle, and Circle buttons as original PlayStation product. 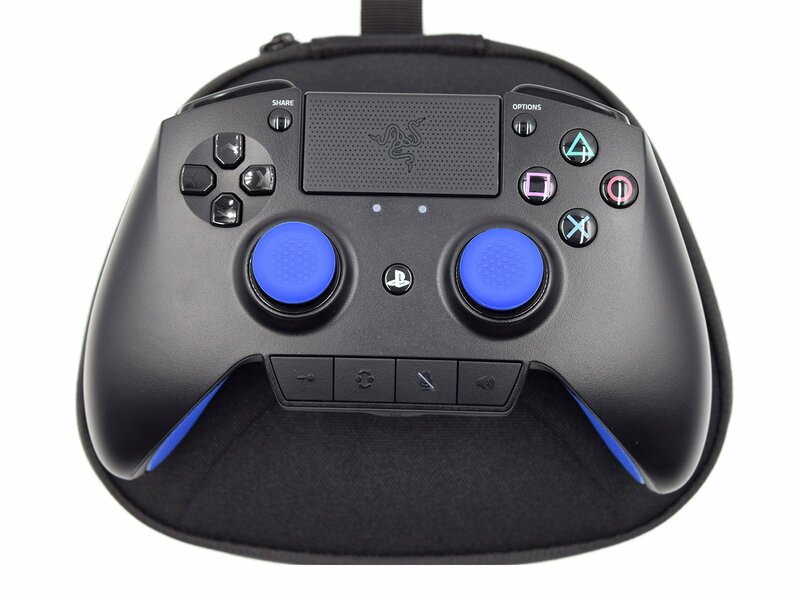 The only difference is that Raiju's buttons don't have as much depth and when you push them, there's almost no travel distance. They instead 'click' similar to the right and left buttons on a mouse. 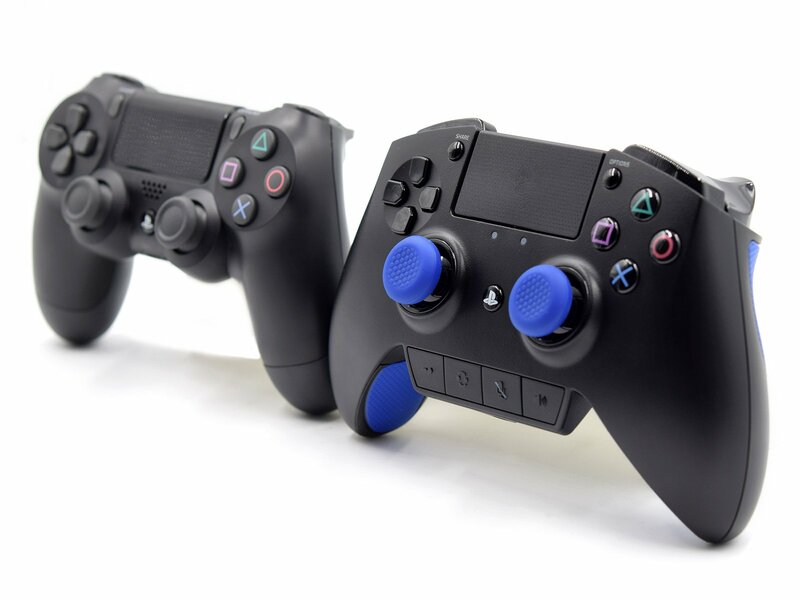 It may feel weird at the beginning but over time you start appreciating that responsiveness and wouldn’t want to go back to standard button presses like normal PS4 controller offers. 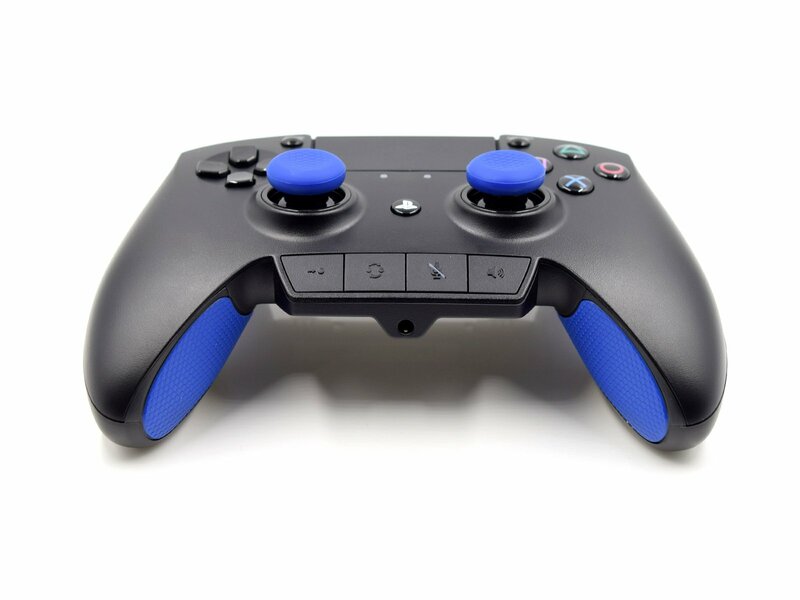 D-pad on Raiju comes as four separate buttons that are not connected to each other and provide a high accuracy of command execution. Unlike the face buttons, the d-pads have a lot of depth to them when pushed, and are much stiffer than a d-pad on a standard Dualshock 4 remote. Again, it’s all about preferences but keep in mind that it may not work well on fighting and other games where horizontal movements are required. 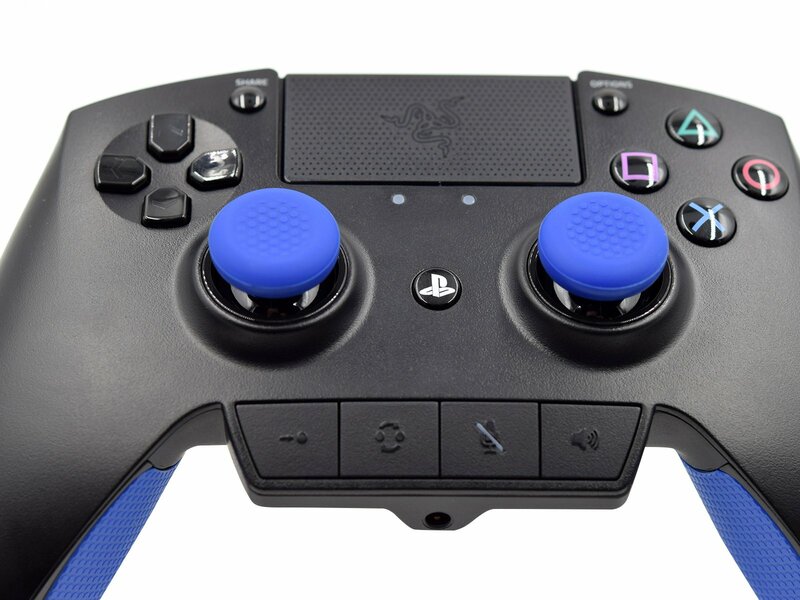 Razor calls it Multi-Function Triggers and Bumpers, these are four buttons total with bumpers being located on the shoulders and removable triggers being located on the underside of the controller. 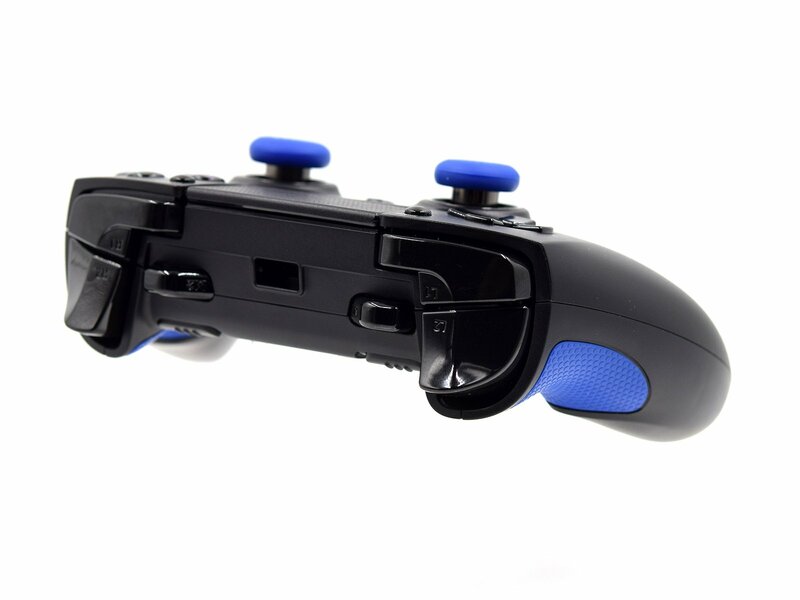 Extra bumper buttons are located within close proximity to the standard bumpers and triggers, which makes them easily accessible for your index fingers. The placement feels natural and I never found myself pressing them by accident. 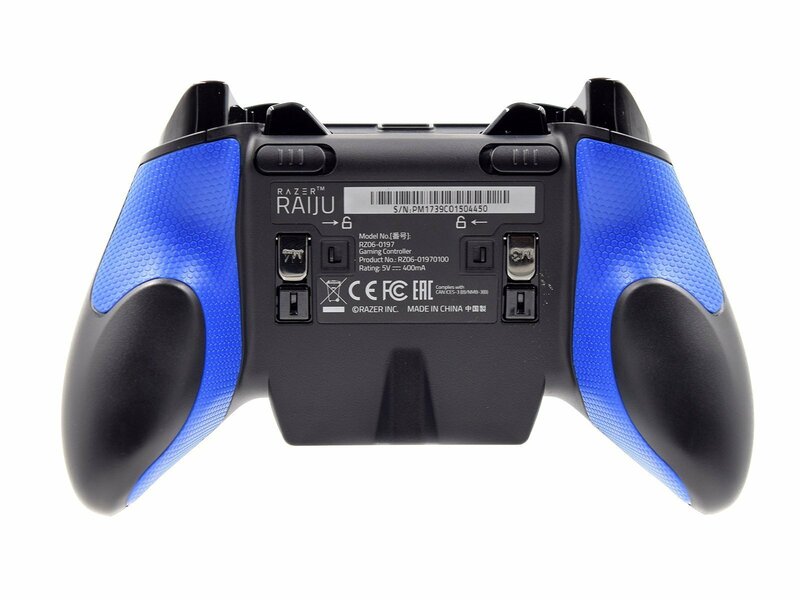 The two triggers that sit on the underside of the Raiju can be remapped to suit your needs similar to extra bumpers.The extra triggers distance travelled when pressed is close to the face buttons. It was a great idea to make them removable in case if four extra buttons is a lot for you.They're easy to detach and reattach. When pressing them, it feels more like a “click” rather than a press. Audio Control Button allows increasing and decreasing the headphone volume on the fly. The Mic Mute Button disables the microphone that is connected to the 3.5 mm headset jack. The other two buttons are used to change profiles and configure extra bumpers and triggers settings. The programming process is very simple and you can always know the profile you are in via the LED indicator. Once any button is configured, the controller will give a feedback via a rumble motors vibration. I would like to wrap my review with the comparison of the most prominent pro PS4 controllers currently present on the market. In my opinion, they are Razer Raiju, Nacon Revolution and Scuf pro controllers. The scuff product is the only one of the three not officially licensed by Sony and to offer wireless connectivity. It also looks like a modified Dualshock 4 while the other two are based on Xbox One controller in terms of the shape and design. 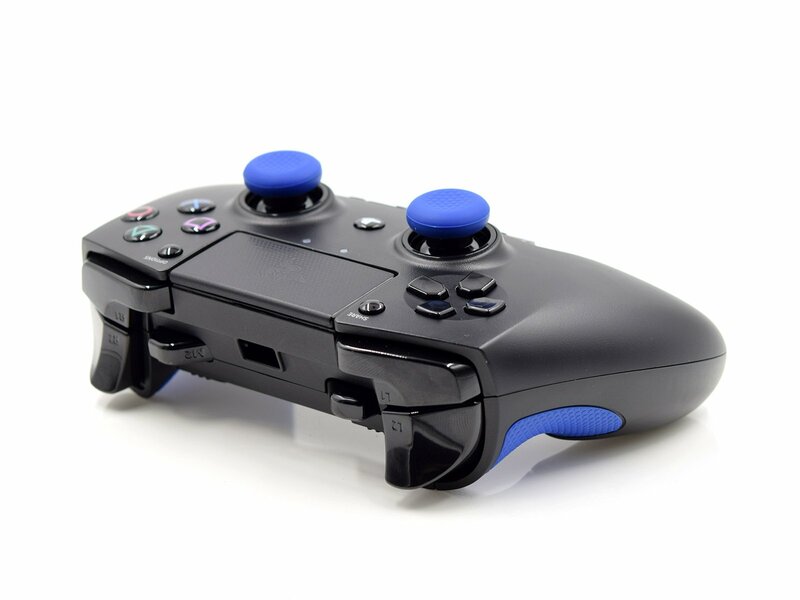 As for customization, Scuff pro remote provides it all the way meaning you can basically change any part of it - d-pad, sticks, face buttons e.t.c. I got mine with trigger extenders for better accessibility, removable circle for the d-pad which it makes it easier for rolling, four options for sticks that are interchangeable and removable and paddles on the back to be able to change button remapping. 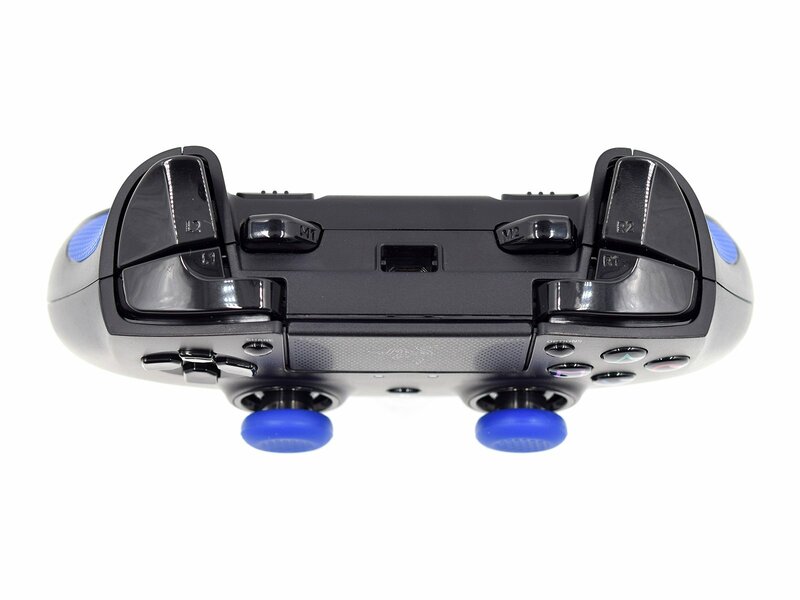 Nacon Revolution is slightly sicker in the grips area than Xbox One controller and comes with user-friendly and non-slippery its thumbsticks providing a great control of the movements. It’s the only product out of the three that uses actual software for the functionality customization, therefore you will need a PC to modify things like trigger sensitivity, stick acceleration etc. Moreover, the Revolution offers macros creating option while Raiju and Scuff don’t. So what’s the final verdict? Obviously, tastes differ and at the end, it comes down to your personal gaming style, habits and preferences. 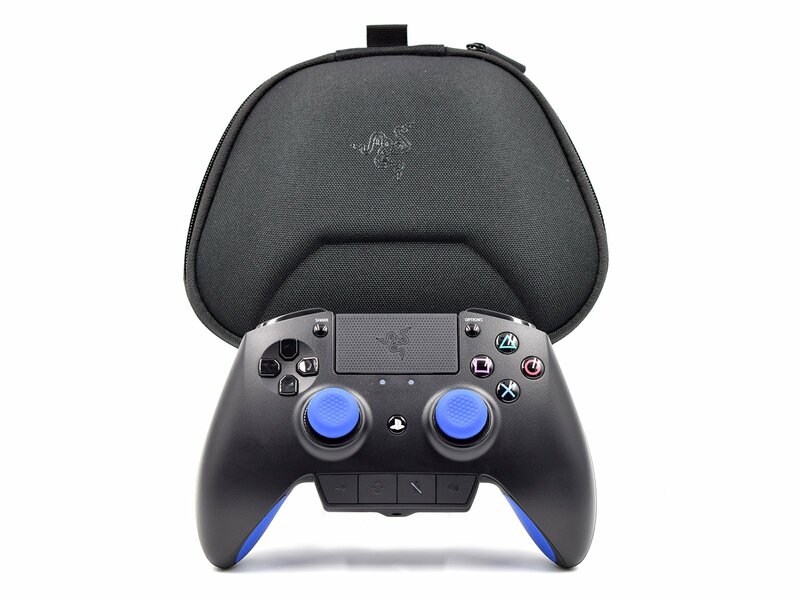 After spending a decent time playing with each pro controller, I give my vote to Razer Raiju. 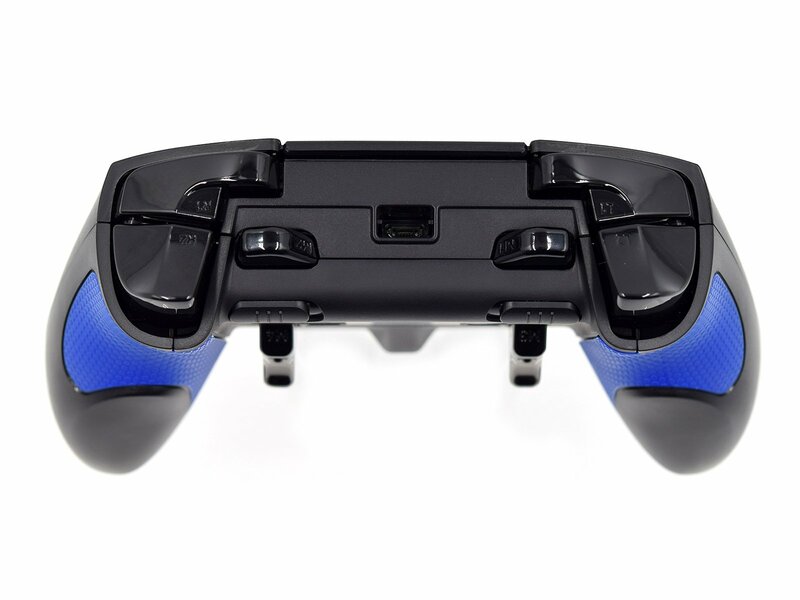 Although it’s lighter on customizations compared to the other two, it delivers the best look, the most comfortable grip and gives you that feeling of quality. 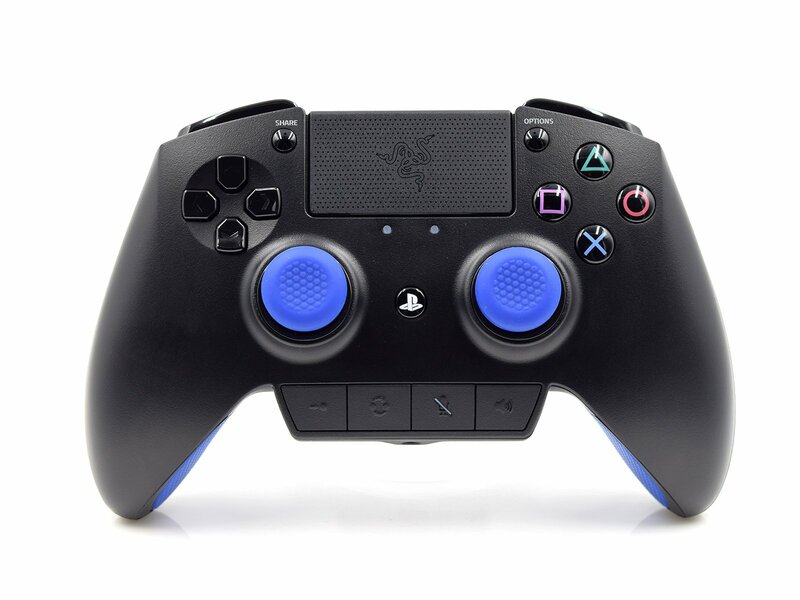 With all the features described in detail, can a Razer Raiju be called a PS4 Elite controller? 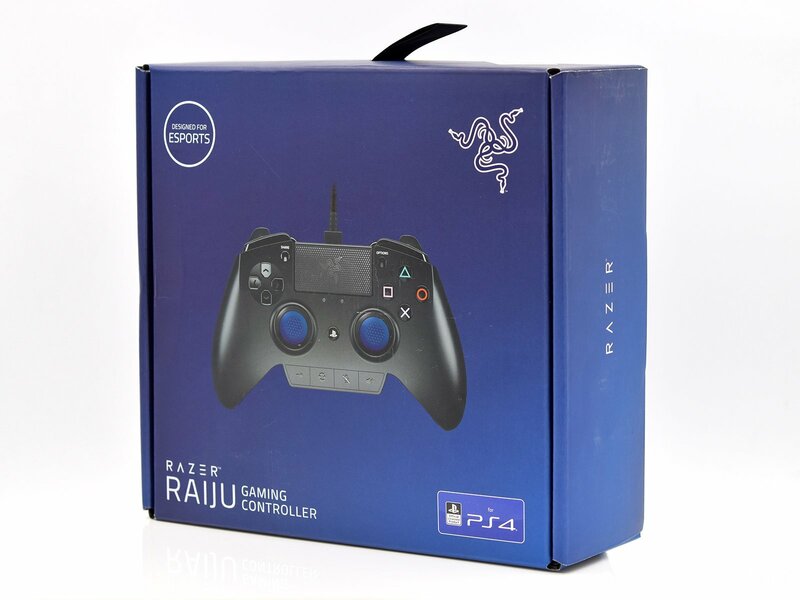 Please comment below on your experience with Raiju.